There will be four sample worlds in the final product of Gates. To show you what sort of worlds you can expect here is a taste of one of them. This world is meant to be familiar, yet interesting. A classic fantasy world. The others are a bit different. Such as a cyberpunk world, one set in fairytales, and another that is a wasteland that tests even the strongest of Gate Striders. The information of this world may change in the future as the game moves forward. Islia is a world where heroes come from. It is a place where, no matter where you go, you will find something grand and magical. Its deserts are exotic, its mountains are full of drakes and dungeons, even its oceans are filled to the brim with warring merfolk and sea serpents. The people of Islia have a natural urge to explore and adventure. Indeed, many of the people of Islia have very little choice in the matter. This is a world with over twenty Gates known. Thus, Gate Striders come here to rest, recover, and to go on grand adventures. More importantly, however, this is a world that can boast creating the most Gate Striders of them all. The world itself is largely untamed. Vast wilderness hide ruins of old and homes of those who do not wish to be found. Wandering monsters pillage and eat anything in its path. Anyone can set off into the forests and be faced with a trial before they can even say “Adventure”. This section will show the world, not a prebuilt campaign. So there will not be statistics for enemies, Combat maps, or anything of the sort. Rather, this section will detail five areas of the world, three sub-areas for each one, and story ideas for each sub-area. This section will also discuss the different types of people, and the dangers of the world. Islia is made of two continents, both of equal size, an eastern and western continent. The western continent is broken into several islands, while the eastern continent is larger. The more south you travel, the hotter the and dryer it becomes. The world is lush, with plants and animals of all variety and large healthy oceans. The animals of Islia are fairly similar to our own, save the magical creatures and monsters. Nenmaa is a vast desert located in the south western aea of the world. It is also the largest singular empire. Nenmaa’s control includes the southern half of the eastern continent. Nenmaa is an empire ruled by a Queen. Always a queen, a lineage of daughters. They have spread from their desert lands down to a large island to the south, and north into the Central Woodlands. They conquered the other desert peoples of Isla, uniting them under one rule. Nenmaa is a empire built upon slavery. They do not enslave humans, but rather various magical creatures. Most of its power comes from 1001 Djinn bound into servitude. 99 to the city of Nemnei, 200 to keep the land safe, and 701 to expand the empire. 200 of the Djinn designated to expand have been killed, and the rest now realise they are mortal, which has slowed the expansion of the Empire. Other creatures have been magically bound to their servitude as well, including elementals, Lesser Sphinx, and even giants captured from the stone carved mountains. The Western Wilds were named not for the wild of nature, but for the wild nature of people. It is a land constantly at war. The men of the Western Wilds constantly build castles, keeps, and fortresses to hold a small amount of land. It is a land full of several dozens of small kingdoms where at least three kingdoms rise and fall a year. This makes for a fluid and ever changing political landscape. This unstable land makes it difficult to educate anyone, so few people can read and write. The wars fought in the Wilds are violent, but they are less deadly than many of the wars elsewhere. Magic is used to heal the wounded, and even rival kingdoms feel a kinship with each other. Two men from the Wilds who meet in a faraway land will greet each other as comrades, even if their kingdoms hate each other politically. Even Kings have high opinions and respect with one another, sometimes meeting in peace for a fine meal while the two kingdoms are at war. 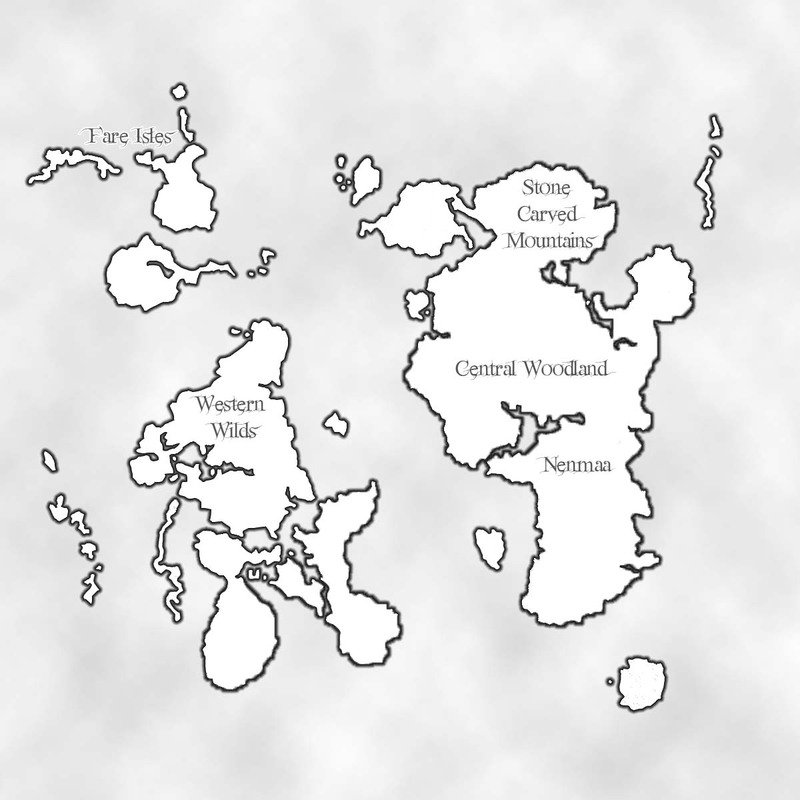 The Wilds are located in the western continent, south of the Fair Isles. It is ruled by humans, but kingdoms or orcs, goblins, and other creatures occasionally arise. This part of the world is north of Nenmaa and South of the Stone-Carved Mountains.The vast majority of the land is a large boreal forest. The southernmost point of the woodlands is a large plain which bleeds into Nenmaa and eventually converts into a desert. The Central Woodland is a difficult place to live. While it is beautiful and vast, it is also filled with all sorts of monsters, evil creatures, and dangerous tribes of goblins. The only people wild and tough enough to tame this land is the wolf-like and centaurian Lourulf. The Lourulf have over a hundred different tribes which wander the boreal forest of the Central Woodlands. They are nomadic in nature, and consistently scrabble and fight for territory. Travelers to the Stone-carved mountains who must pass through the Central Woodland often seek out tribes of Lourulf to guide them. The animals of the Central woodland tend to be large and healthy. There are true rumors of several animals spotted that are much larger than they would naturally be. Moose which stand twenty feet tall. Bears that knock over trees. Eagles who make nests the size of a large house. These are just a few of the examples. To the north of the Central Woodlands is a vast range of mountains collectively known as the Stone-Carved Mountains. Life on the mountain is harsh. The only creatures that thrive here are the giants, monsters, and dwarves. The Dwarves of Islia claim this territory as their own. They are particularly suited to surviving in these harsh environments because these dwarves are not made of flesh and warm blood. Instead, they are constructed from the mountains themselves. The Giants of the Stone-carved mountains range from 30 to 50 feet tall. They live with an honor system which keeps them peaceful against the Dwarves. The Giants live in wandering tribes, and often battle amongst themselves. Sometimes, a giant goes mad and decides to fight the Dwarves, or even head south into the Central Woodland. To the north of the Western Wilds is several large islands collectively known as the Fair Isles. This is the home of the Islian Elves and the center of magic in Islia. If magic was like water, then the Fair Isles would be an ocean. The creatures of the Isles are often born with magical qualities. Bears that can speak, birds who lay diamond eggs, or fire breathing lizards. Some of the plants and natural geography of the Fair Isles are just as magical. Rare flowers that brew a tea of immortality, a lake that heals all wounds, or even a cave which echoes your deepest regrets back to you. The Elves of the Fair Isles were human many thousands of years ago. But the magic seeped into their very being over the generations, turning them into elves. They live in cities and villages, farm the land, and tend to their seas. They trade with both Nenmaa and the Western wilds. Mages are also drawn to this land in order to study magic. If you want to chat about Gates with other Stormforge players and the developers, then come join our Discord server!